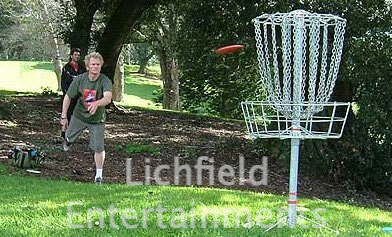 Disc Golf is a recent addition to our hire range and is a game suitable for anyone who's old enough to throw a frisbee. The game follows the same idea as traditional golf but with a frisbee instead of a ball. The aim is to take a series of throws to hit an aerial target basket with your disc or frisbee rather than putt your ball into a hole. The person using the least number of shots wins. In traditional golf you have different clubs for different shots and in Disc Golf you have different discs for different shots and distance requirements - a Driver Disc, Mid-Range Disc, and Putter Disc. Disc Golf is perfect for corporate events, team building, schools, youth groups, and general fundays. The game can be set-up to suit the space available, from a couple of short throw baskets to a series of full on 200 yard holes using the surrounding landscape of any venue to make the holes more challenging! If you have any queries, questions, or would like to hire Disc Golf please click here to enquire and we will do all we can to help.